Gal Gadot was on fire at the Wonder Woman premiere tonight! The 32-year-old actress dazzled in a bold red gown as she hit the blue carpet at the event held at the Pantages Theatre on Thursday (May 25) in Hollywood. She was joined by her co-stars Chris Pine and and Robin Wright. Also in attendance from the film were Connie Nielsen, Lucy Davis, Danny Huston, Elena Anaya, Eugene Brave Rock, Ewen Bremner, Madeleine Vall, and director Patty Jenkins. Kellan Lutz, Danielle Panabaker, Candice Patton, and Crystal Reed came out to show their support as well. Gal even snapped some pics up with Lynda Carter, star of the original Wonder Woman! “Wonderful (see what I did there?) to be with the lovely @gal_gadot at the World Premiere of Wonder Woman! !” Lynda shared on Instagram. FYI: Gal is wearing Givenchy, Aldo sandals, and Tiffany & Co. jewelry. Robin is wearing Saint Laurent. Connie is wearing Alberta Ferretti. Patty is wearing Solace London. Danielle is wearing an AQ/AQ dress. Lynda is wearing Max Mara. 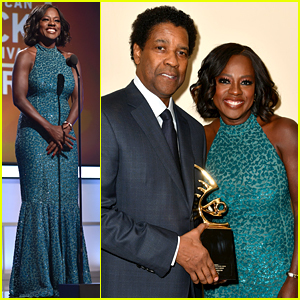 Viola Davis poses backstage with Denzel Washington after accepting the Hollywood Legacy Award during BET’s American Black Film Festival Honors on Friday (February 18) in Beverly Hills, Calif. The actors were joined at the event by their Fences co-stars Jovan Adepo and Saniyya Sidney. Other stars who attended the event included Viola‘s How to Get Away with Murder mom Cicely Tyson, Queen Latifah, Common, Pitch‘s Kylie Bunbury, Insecure‘s Issa Rae and Jay Ellis, Empire‘s Grace Gealey and Trai Byers, True Blood‘s Rutina Wesley, Famous in Love‘s Keith Powers, The Flash‘s Candice Patton, Grey’s Anatomy‘s Isaiah Washington, Roots‘ Anika Noni Rose, Hidden Figures‘ Aldis Hodge, Beaches‘ Nia Long, Dope‘s Kiersey Clemons, and When the Bough Breaks‘ Regina Hall. FYI: Viola is wearing a Michael Kors Collection gown. Queen is wearing a Randi Rahm dress. Kylie is wearing a Solace London dress. Maksim Chmerkovskiy gives a kiss to fiance Peta Murgatroyd at the 2016 Entertainment Weekly Pre-Emmy Party held at Nightingale Plaza on Friday night (September 16) in Los Angeles. The two pro dancers and expectant parents joined fellow dancer Allison Holker at the party, as well as actors Katie Cassidy, Zelda Williams, Amanda Crew, Elizabeth Henstridge, Isabelle Fuhrman, Brenda Song, Caity Lotz and Candice Patton. Modern Family stars Ariel Winter, Sarah Hyland, Nolan Gould, Rico Rodriguez, Ryan Guzman, Yara Shahidi, Marcus Scribner, and Lorenzo Henrie were also seen inside the party. Derek Hough is also pictured at TV Guide Magazine’s Television Industry Advocacy Awards at Sunset Tower Hotel in West Hollywood. Earlier in the night, Yara and Marcus stepped out at the Television Academy Reception for Emmy-Nominated Performers at Pacific Design Center. FYI: Katie wore a Cristiano Burani vest and pant suit and a Maria Lucia Hohan metallic body suit. Yara wore an Akris ensemble to the Television Academy Reception. Allison is wearing a House of CB ensemble.